Home of Crystal Creek Anglers & Stillwater Fly Fishing Systems, including instructional information such as Denny Rickards hosted fly fishing schools, guided trips, books and videos on fly fishing and fly tying. 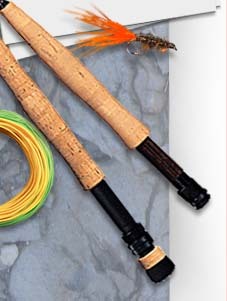 You will find fly fishing products including: rods, reels, lines, and accessories, flys, fly tying materials, and fly tying patterns. If your club or organization is looking for a speaker, Iâ€™ll be glad to discuss details regarding subject matter, speaking fees, travel and motel for overnight stays. My area of expertise is stillwater fly fishing and I try to focus primarily on the presentation aspects of fly fishing lakes. That includes where to fish, proper lines for each depth, pattern choices, retrieves, balancing tackle requirements, adjusting for existing conditions, casting for distance, understanding the impact of weather changes and much more. Iâ€™ll be glad to discuss donating books or DVDâ€™s for club raffles or fund raising events when speaking at your club. Our Calendar of Events gives dates, locations and fees for all up coming winter shows, stillwater clinics and hosted trips. - Buy any FOUR DVD's and Save $20.